With the media overload of the 21st Century, poets are bound to ask: How much of this information sticks and is it absorbed in the way that is expected? 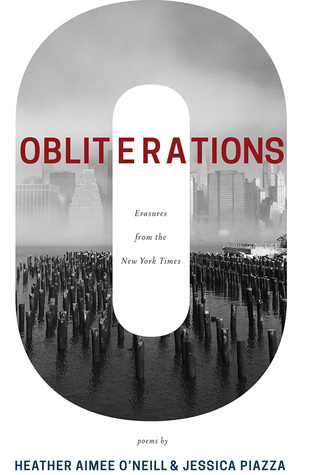 Obliterations: Erasures from the New York Times by Heather Aimee O’Neill and Jessica Piazza, one of the best new authors according to CBS Los Angeles, explores that process by taking articles found in a variety of sections of The New York Times, including real estate and obituaries, and erasing words until a poem emerges from the detritus. Neither poet knew what the other created, and what has emerged is a collection that speaks not to ephemeral constructs but to concrete concerns and connections. Most of us know that people who hear or read it at the same time never absorb information in exactly the same way, but what’s most fascinating about this collection is how many of the poems seem to respond to one another when placed side by side. 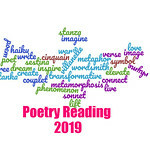 Piazza and O’Neill’s poems for Education use the article “Varied Paths Toward Healing for Sites of Terrorized Schools” by Winnie Hu for inspiration, exploring the aftermath of school shootings. “Healing” provides a sharp, zeroed in image of red, a shade that cannot be forgotten because the memory of that violence is seared into the mind’s eye. In answer, “Toward Healing” takes a look at the broken pieces of the school, the touch of violence only to reclaim those terrifying memories to create a “shrine” of hope. Both poems parallel Hu’s article. Violence of this nature is deeply affecting, and people internalize it in different ways, taking from it a sense of hope for the future in those who survive or feeling that deep pessimism that comes from loss of young potential. In these poems, Piazza and O’Neill are not only looking at how information is internalized and processed, but they are commenting on the information’s presentation by the journalists who wrote the articles. In most of these poems, it is clear that journalists no longer just report facts and data, but also offer a personal perspective on their subject matter. For instance, the obituary of J. Robert Oppenheimer, the technical director of the Manhattan Project, explores the man’s career and his regret over how the atom bomb was used, but it also discusses the disconnect he saw between what scientists create and how it is used. “Bomb” and “Atom Bomb Pioneer” both pay homage to the creation of science but never shy away from the connection – both good and bad — between its development and its use. From “Bomb”, “Art was delicate work. Sciences,/a celebrated ivory-tower, almost/wholly divorced from its gravity.// A change of direction that added/sinister overtones to the awakening/world.// A love affair, now dead.// A continuing fury that unified/the immense, tension-filled world.” But in “Atom Bomb Pioneer,” we see Oppenheimer in a different way with the telling end line, “I have known sin,/ he offered.//” Piazza and O’Neill bring the full weight of that creation to the fore, asking us to consider the consequences not in retrospect but in the present. They also take up that mantle of perspective to show readers a new outlook on the subject at hand. In the words of Pablo Picasso, “Every act of creation is first an act of destruction.” Obliterations: Erasures from the New York Times by Heather Aimee O’Neill and Jessica Piazza leaves us with the digestible pieces that can be easily swallowed and endured. But within these pieces, we realize that the whole is not destroyed but enhanced in this innovative poetry collection. Jessica Piazza is the author of three poetry collections: “Interrobang” (Red Hen Press), “This is not a sky” (Black Lawrence Press) and, with Heather Aimee O’Neill, “Obliterations” (Red Hen Press, forthcoming). Originally from Brooklyn, NY, she holds a Ph.D. in Creative Writing and English Literature from the University of Southern California, an M.A. in English Literature /Creative Writing from the University of Texas at Austin and a B.S. in Journalism from Boston University. She is co-founder of Gold Line Press and Bat City Review, and curates the Poetry Has Value blog, which explores the intersections of poetry, money and worth. You can learn more and read her work at www.jessicapiazza.com and www.poetryhasvalue.com. Heather Aimee O’Neill is the Assistant Director of the Sackett Street Writers’ Workshop, and teaches creative writing at CUNY Hunter College. An excerpt from her novel When The Lights Go On Again was published as a chapbook by Wallflower Press in April 2013. Her poetry chapbook, Memory Future, won the University of Southern California’s 2011 Gold Line Press Award, chosen by judge Carol Muske-Dukes. Her work was shortlisted for the 2011 Pirate’s Alley Faulkner-Wisdom Writing Award and has appeared in numerous literary journals. She is a freelance writer for publications such as Time Out New York, Parents Magazine and Salon.com, and is a regular book columnist at MTV’s AfterEllen.com. What an interesting premise for a poetry collection! I love this concept and am especially intrigued by the side-by-side comparison of the two poets. I must find this. Thanks for the recommendation! It is such a good collection.